3 queen-size beds, 2 queen sized sofa beds, 3 full baths, full kitchen and even a kitchenette in one of the bedrooms! Updated, ski-in ski-out Mountain Club 2 bedroom with 2 separate sleeping areas for maximum privacy. Great for one large group or 2 families of up to ten people, this condo offers ample space for entertaining guests and making the most of a family vacation. 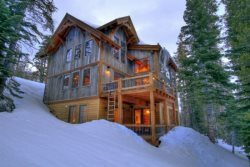 It's a true "Ski in, Ski out" home perfect for avid skiers as well as for those of us who like to watch our loved ones ski from in front of a fireplace. The Mountain Club is the most sought after complex in Kirkwood due to it's proximity to the lifts and access to a gym and hot tub. What makes this home so unique is the 2 separate sleeping areas, one in the loft bedroom located upstairs above the main living area and the other in a downstairs bedroom. The loft bedroom sleeps two on a queen bed, two on a sofa bed and features a private bath. The living area below the loft bedroom has a queen sofa bed, a fully equipped kitchen, a downstairs 3rd guest bathroom, a balcony, a cozy gas fireplace and flat screen tv. The 2nd downstairs bedroom is actually a mini condo in itself. It has two queen beds, a private bathroom and kitchenette which can be locked, providing extra privacy from the rest of living quarters. One neat feature of this home is its access to a hot tub, gym and ski locker room. You can come right off the slopes, put your skis or snowboard away and slip into a toasty hot tub to calm your muscles after a long day on the mountain! The Mountain Club’s best feature is, hands down, its proximity to five ski lifts, three restaurants, the new outdoor bar, the ski repair shop, Mountain Club hot tub, and Kirkwood’s retail ski store. With true ski-in, ski-out access, stopping in for a ski break is no sweat. When you’re done on the hill, feel free to stop by the recreation center, where you’ll find an array of fitness equipment, a sauna, hot tub, and full locker rooms with showers. Access to a hot tub is a rare find in Kirkwood! An adjacent ski locker room allows you to conveniently store your equipment and opens out to the base of chairs 10 and 11. Each rental is assigned a spot, either in the underground garage or lot adjacent to the Village Plaza. Each condo also comes equipped with complimentary wifi and cable tv. Hot tub and fitness center downstairs- rare to find in Kirkwood! Mt Club is the best option for serious skiers and snowboarders visiting Kirkwood. You can't get any closer to the lift chairs. We love staying with PP, we probably just won't rent this unit again. It's the closest we've been to the Mt but compared to other units that fit 10 ppl, this one seemed small and the bedding situation (2 sofa beds) was not ideal. You will check in at The Lodge as guests of the owner and leave no credit card or pay any fees to them. You will be given key cards for entering Mountain Club #327/329. If checking in after hours, an envelope with your name will be in the wooden late check-in box located in the front entrance of the Lodge. Parking is located underneath building in space #327.